This arjita (paid) seva is observed before the second bell is over in the morning. 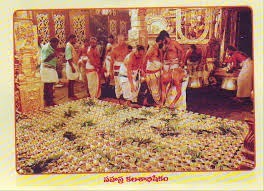 One thousand silver vessels filled with parimala thirtham (pure water perfumed with sandal paste etc.) are placed on abed of paddy. They are homas. Thirumanjana abhishekam is hen done to Bhoga Srinivasa, Malayappa Swami, His consorts and Sri Visvaksena. Then in the sanctum, Ekanta ashtottara - archana is offered to the main Deity. Then in the presence of temple officers akshataropana takes place. this the occasion, when Bhoga srinivasa Murti crosses Bangaru Vakili. Even on the occasion the silk cord cennecting the Bhoga Murti with the Dhruva Beram (Main Deity) is maintained. What is the status of ticket sl.no.1148032 dated 03-06-2008 for Sahasra kalasabhishekam for Rs.5,000/-booked by Sri K. Nagesh, flat no.305, Subham Residency, mehdipatnam, Hyderabad?